Exceptional spacious 4 bedroom apartment set in an exclusive condominium in a quiet sought after location in the prestigious area of Cascais, Lisbon, with communal swimming pool, large landscaped mature garden and sea views. This stylish 1st floor apartment has bright and airy accommodation comprising 2 reception rooms, extra room which can be utilised as a games room/cinema/office, fully fitted kitchen, 3 bathrooms and large terrace with open views. This property has many unique features including underground garage, ample leisure areas, feature fireplace, picture windows and the block is completely walled ensuring upmost privacy. 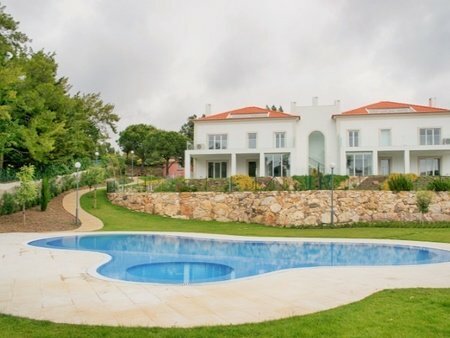 It has the benefit of being close to Estoril Golf and all amenities. Cascais is a charming Portuguese fishing town that is situated on the western edge of the beautiful Lisbon coastline. It is a historic and prosperous town that is filled with grand houses and well maintained parks. At the centre of Cascais is the old town, which has retained its traditional appeal and is an enjoyable place to relax during the day. As the sun sets, the fine restaurants serve up freshly caught fish or other local specialities. The trendy bars are lively and continue late into the night – but Cascais is a resort firmly aimed at couples (of all ages) and young families. Ideal as a large family apartment or rental investment. Note: Although these particulars are thought to be materially correct their accuracy cannot be guaranteed and they do not form part of any contract.